OLYMPIA – With his family in the gallery and flags outside lowered to half-staff, former Gov. 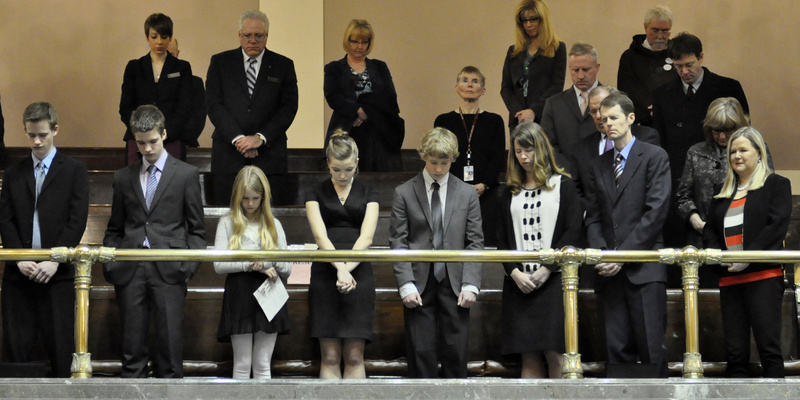 Booth Gardner was eulogized Friday in the Senate chamber where he once served as a champion of children, education and personal choice. A special joint legislative session honored Gardner, who died March 15, with speeches and anecdotes about the former Pierce County executive and state senator who served as governor from 1985 to 1993. As Washington’s 19th governor, he led campaigns to ban smoking in the workplace, start the Basic Health plan and the Running Start program for high school students, and enact the Growth Management Act, legislators recalled. Years out of office, while dealing with Parkinson’s disease, he campaigned for an initiative to allow the terminally ill to receive assistance with suicide. And he did most of it with a smile, an easy quip or a joke. Rep. Sam Hunt, D-Olympia, a former Gardner aide, repeated a story Gardner himself liked to tell, of a stop at a Wenatchee burger joint where the governor asked the teens behind the counter if they knew who he was. They huddled briefly, and came back with an answer, although not quite the right one. “You’re Brock Adams,” one said, confusing him with the state’s junior senator at the time. “He was, like, the funniest guy I ever met,” said Senate Majority Leader Rodney Tom, D-Medina. Because Gardner had a sense of humor, he might have smiled at the fact that some of the legislators in the chamber applauding the speeches aren’t huge fans of some of his programs, like the Growth Management Act, and some strongly opposed the “death with dignity” initiative. An adept politician, he also might have enjoyed the bit of jockeying for the privilege of making one of the speeches – and the fact that House Republicans assigned the job to Rep. Jan Angel, of Port Orchard, who plans to run for Gardner’s old Senate seat against Nathan Schlicher, the Democrat appointed to it earlier this year. A public memorial service is planned for Gardner next Saturday in Tacoma.